Have you heard about Hong Kong 2019-20 Budget proposal? Yes! Great! Hong Kong has released its budget. Therefore, if you want to remain updated and want to do all the operations legally and effectively, then you do require to gather maximum information about the new proposal. Let’s start with the report of the budget that has been proposed by the Financial Secretary, Paul MP Chan. That’s the concern behind this program. So, now the turn comes for the details of the budget. In order to help local enterprises while dealing with the fallout and the uncertainty of the global economic and trade environment, the government has initiated a range of relief measures. We want to highlight the following which is of particular interest to our Hong Kong company clients. For the registered local companies in Hong Kong under the business registration regime i.e. “One-stop Registration,” and one-stop company incorporation, under the section 5A(1)(a) of the Business Registration Ordinance (Cap. 310), the fee will be reduced by a sum of $2,000- as if the related incorporation submissions are made within the period from 1 April 2019 to 31 March 2020 (“Waiver Period”). While for other cases, the fees payable in the regards of the branch registration and business registration certificates with the commencement date falling within the Waiver Period will be reduced by a sum of $73 and $2,000 respectively. However, in order to protect the wages on Insolvency fund, organizations are still required to pay the levy. Have you understood the above-stated details? Great! Let’s embark with the concessionary refund of the registration fees paid. Do you ever hear that some companies paid the registration fees for the Waiver Period, but they don’t pay for the certificates to get renewed while applying in the Waiver Period? Well, yes! This happens! And in this situation only, business owners can also benefit from the concessionary measure. With a commencement date before 1 April 2019 and expiry date on or after 31 March 2020, branches or business entities, which are holding a 3-year registration certificate. The ceased branches or businesses which have held a 1-year registration certificate with an expiry date on or after 1 April 2019; however, before 31 March 2020. The ceased businesses or branches, which are having a 3-year registration certificate with an expiry date between 1 April 2019 and 31 March 2020. Under the One-stop Registration, the local companies registered which make incorporation submissions between 1 April 2018 and 31 March 2019 and hold a 1-year or 3-year registration certificate with a commencement date between 1 April 2019 and 31 March 2020. More importantly, you don’t need to have an application. The IRD will announce the refund arrangement after the Legislative Council passes the relevant legislative amendment. 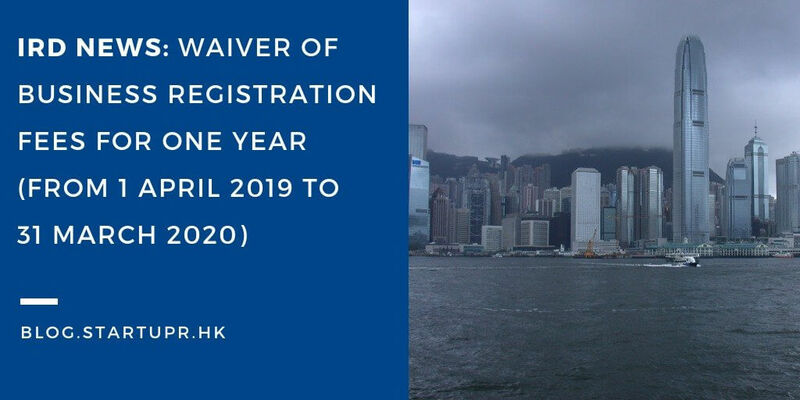 As per the Business Registration fee $2000 HKD will be waived (no need to pay), we will update our price for company formation starting from 1st April 2019 for one year. As a matter of fact, all the business owners need to incorporate the business, before executing the plan. Make sure that you are selecting the right business structure as per the demands of your business. The business structure would define your exposure to liability, taxes, and even the ability to run the business and raise capital from investors. Well, Startupr offers a complete package for the renewal of all the services. The renewal of the Company Secretary package is $1014 USD and it holds the following services: for the renewal of all the services. $320 USD which is the CR Incorporation and IRD – Business License, need to be paid to the government. However, it was $530 before. $225 which is for the Startupr local secretary. $105 is the Annual return fee, which is related to your company particulars as a recapitulation (nothing related to your business or profits), reported to the Companies Registry (CR), need to file annually within 42 days of Anniversary date, even if the company structure has not been changed. $ 99 USD you need to pay for as an incorporation fee designed by Startupr. the Registered Address is 0 US$ (Free of Charge). Certified Copy of Documents by CPA is $125 USD (1 Set). DHL & Handling Fee is just $ 95 USD. For more information about the incorporation fees in Hong Kong, visit, our company incorporation page. Having many years of experience in the field, Startupr has priced the services reasonably. And with this, you can pay less by customizing the form and choosing the services that you need. Now that you have a better idea about the incorporation fees offered by Startupr, the next thing that you need to know about the renewal fee for 2019-2020. There is no denying the fact that the Business Registration Certificate is due for one of the Hong Kong renewals around one month of its expiration date. Startupr as an Agent or Company Secretary – $225/per year. Renewal of Business Certificate (Government fees) & Lodgement Fees of the Business License $55 USD *– Government Fees. Note– This renewal fee only apply to the company renews within the period 1st April 2019 to 31st March 2020. If you are still looking for more information, then visit our company renewal page. Ready for setting up the business in the freest economy of the world? Then hire Startupr as your Company Secretary. We would be more than happy to take care of the renewal of the company secretary and the business registered address package along with the business registration certificate. More importantly, we will also notify you when you need to renew your company and will help you in preparing all the government filings so that your company can stand out of the ground. We make all the paperwork easy and let you focus on running your business!